Portuguese is an option in the Romance Languages major, and the Program in Latin American Studies offers a minor with a focus on Portuguese language and Brazilian culture. Apply now for 2019 Intersession study abroad in Cape Verde: Service Learning & Luso-African Society. Students will earn 3 credits as they study in Cape Verde from Jan. 6-25. Applications are due Oct. 1. Apply on the Study Abroad website. 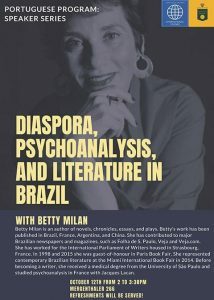 Join us from 2-3:30 p.m. on Friday, Oct. 12 for “Diaspora, Psychoanalysis, and Literature in Brazil” with Betty Milan. The event will take place in Mergenthaler 266 and refreshments will be served. 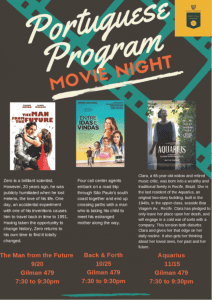 This fall, join the Portuguese program for three movies: The Man from the Future on Sept. 20, Back & Forth on Oct. 25, and Aquarius on Nov. 15. All movies will be shown in Gilman 479 from 7:30-9:30 p.m.